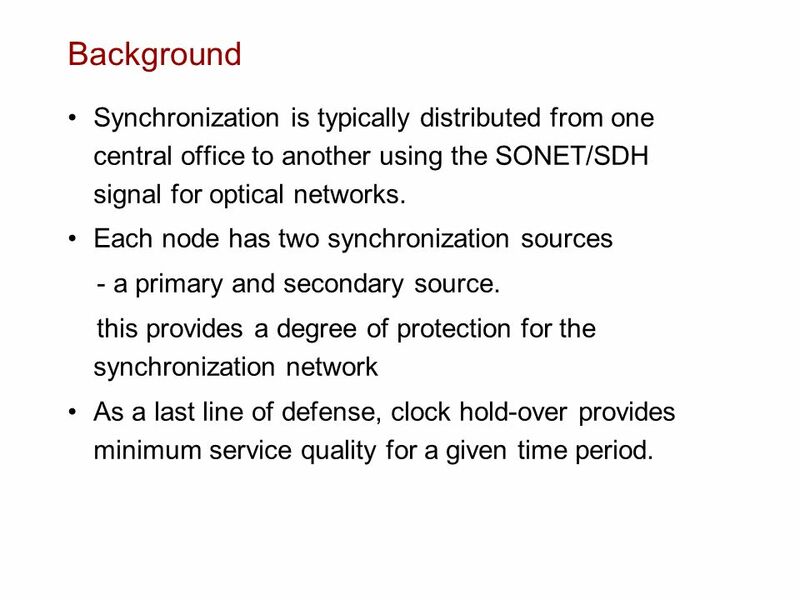 3 Background Synchronization is typically distributed from one central office to another using the SONET/SDH signal for optical networks. 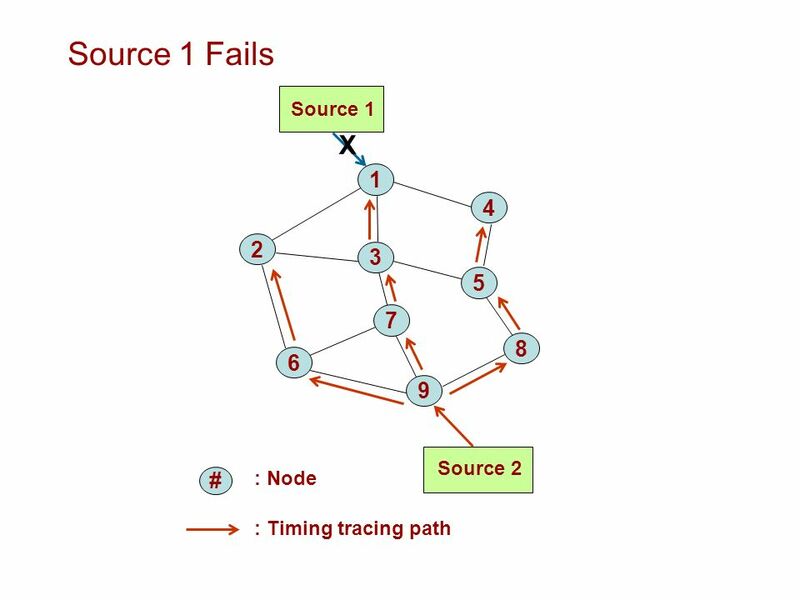 Each node has two synchronization sources - a primary and secondary source. 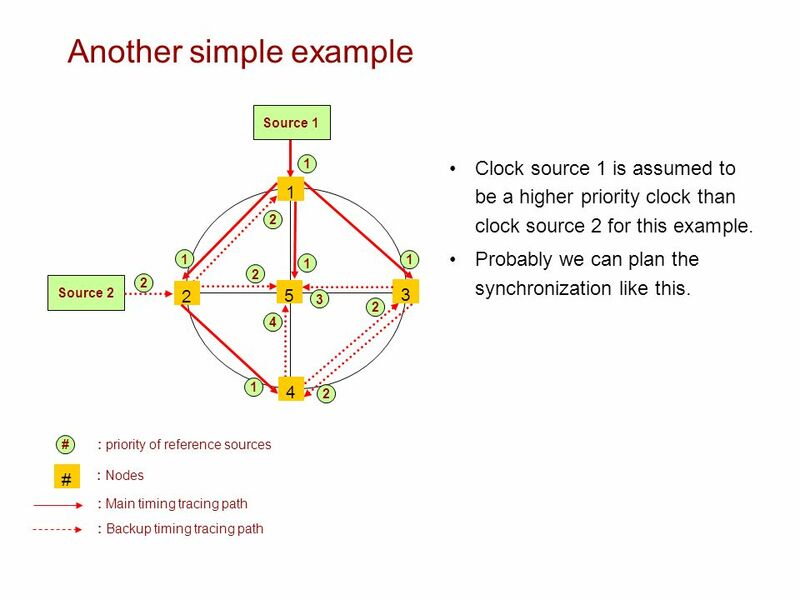 this provides a degree of protection for the synchronization network As a last line of defense, clock hold-over provides minimum service quality for a given time period. 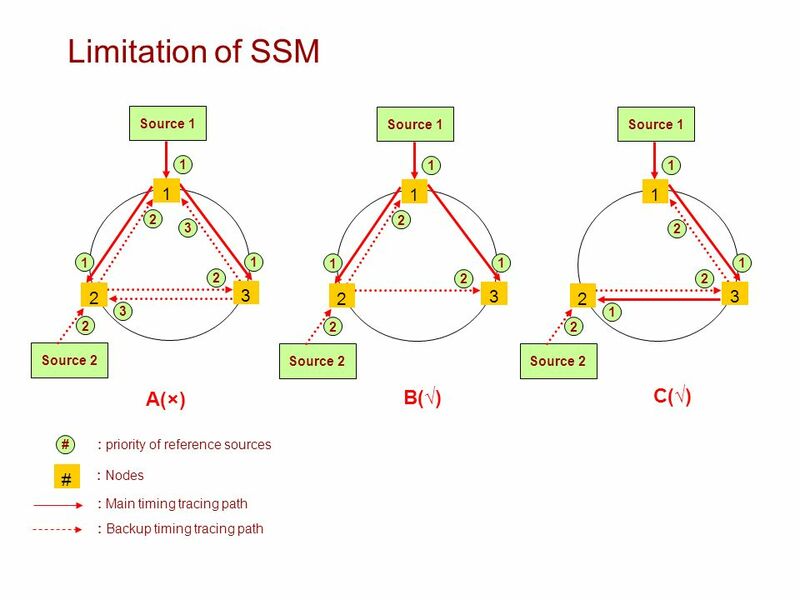 5 Todays Network Synchronization planning and distribution is administered manually base on SSM (G.781) usually. 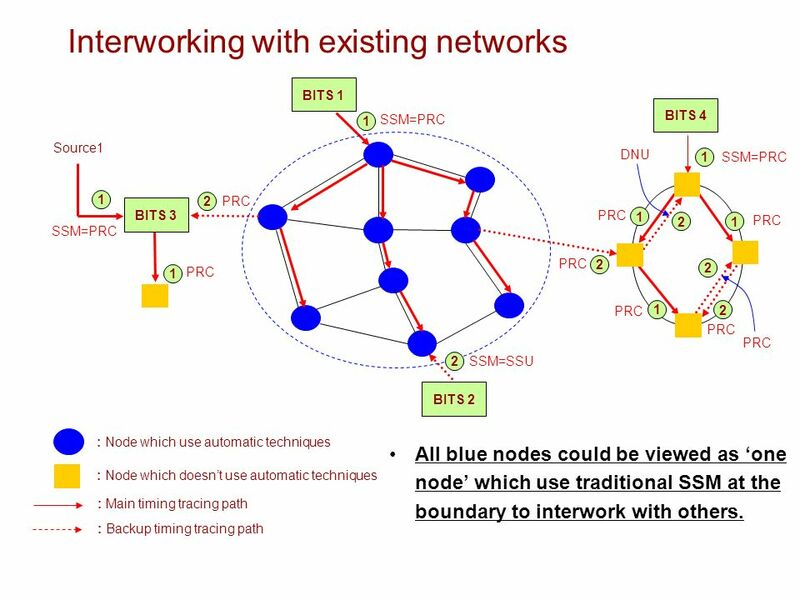 SONET/SDH networks are primarily implemented in linear and rings architectures. 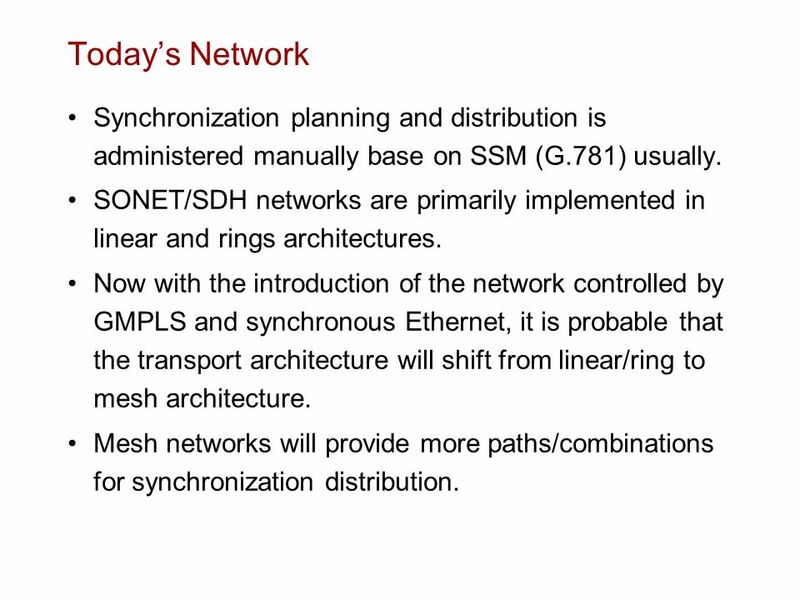 Now with the introduction of the network controlled by GMPLS and synchronous Ethernet, it is probable that the transport architecture will shift from linear/ring to mesh architecture. 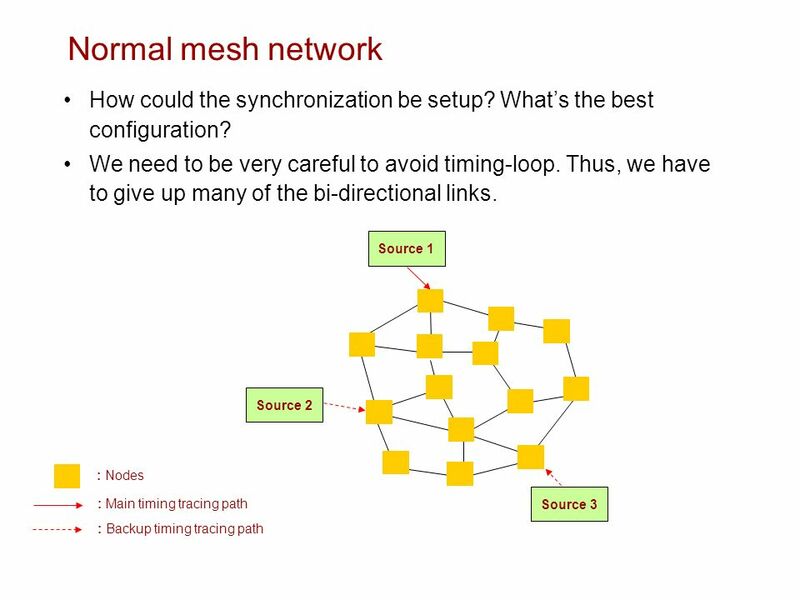 Mesh networks will provide more paths/combinations for synchronization distribution. 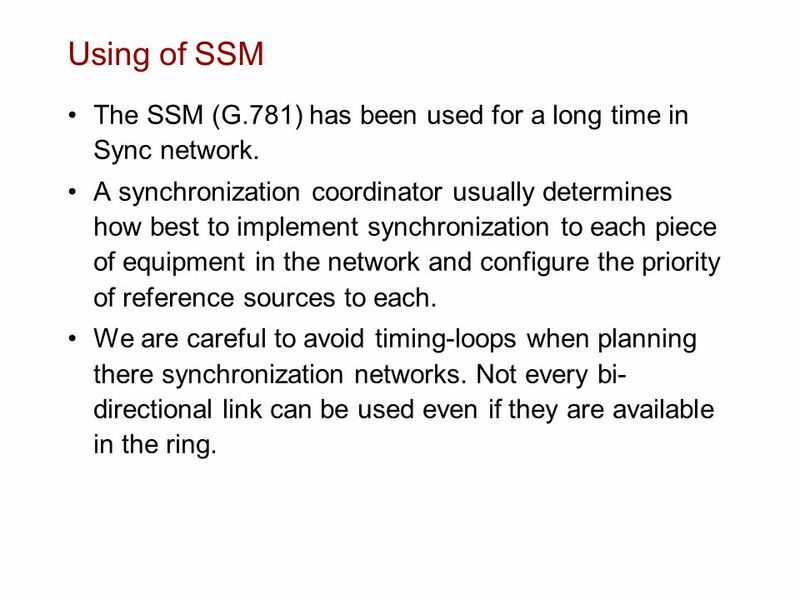 6 Using of SSM The SSM (G.781) has been used for a long time in Sync network. 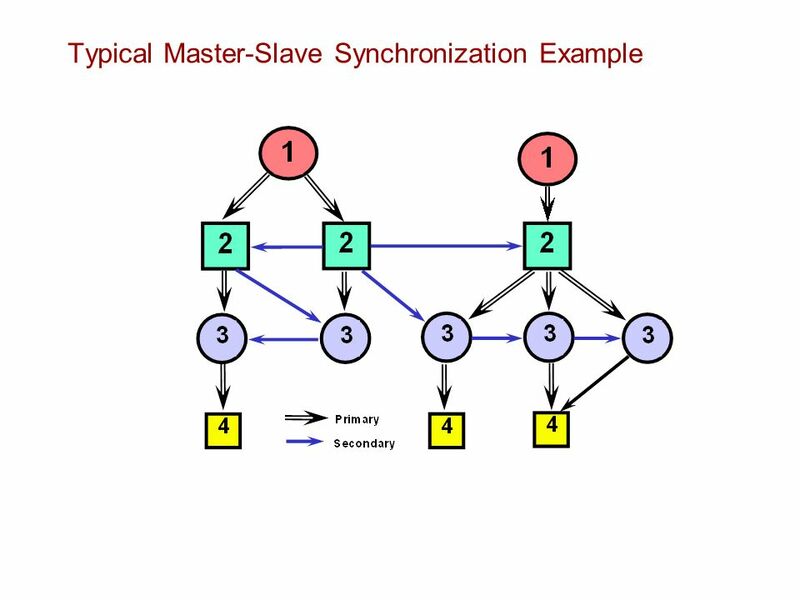 A synchronization coordinator usually determines how best to implement synchronization to each piece of equipment in the network and configure the priority of reference sources to each. 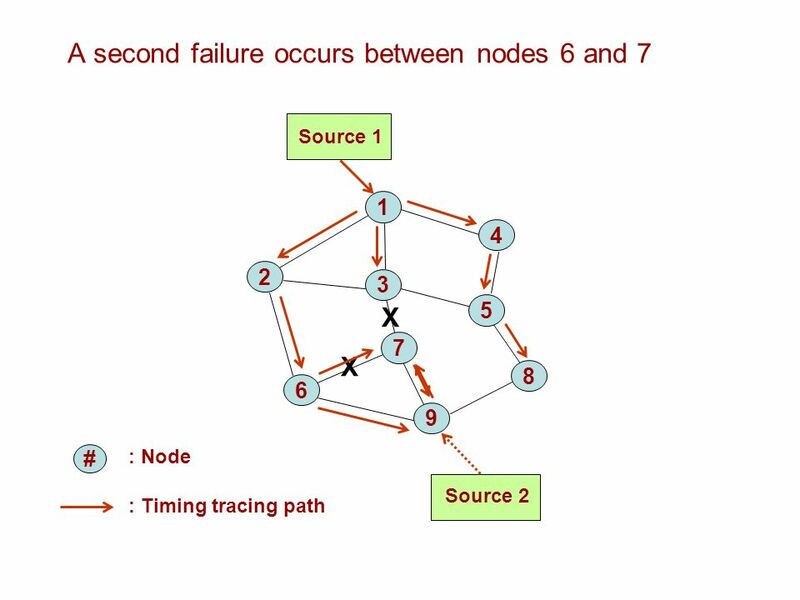 We are careful to avoid timing-loops when planning there synchronization networks. Not every bi- directional link can be used even if they are available in the ring. 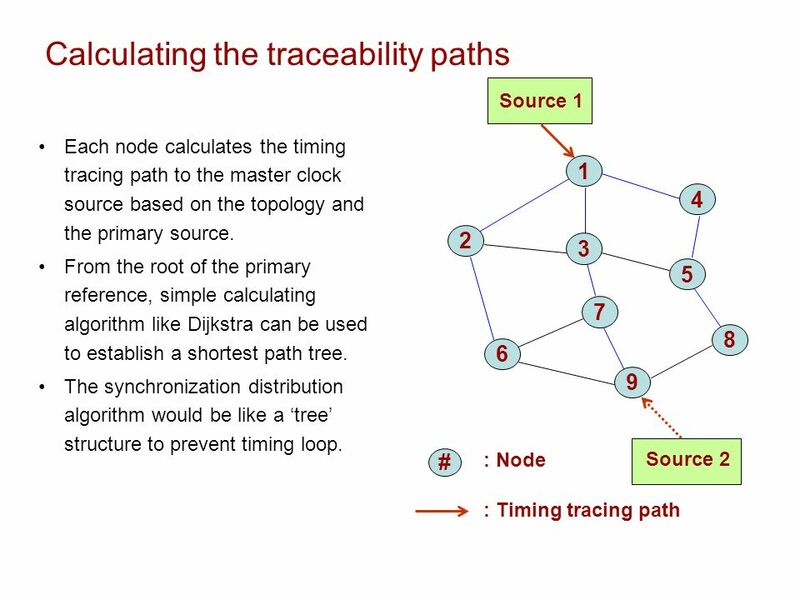 8 Another simple example 1 2 3 Source 1 4 3 1 1 2 2 Source 2 5 4 2 1 1 1 2 2 : Nodes : Main timing tracing path : Backup timing tracing path # # : priority of reference sources Clock source 1 is assumed to be a higher priority clock than clock source 2 for this example. Probably we can plan the synchronization like this. 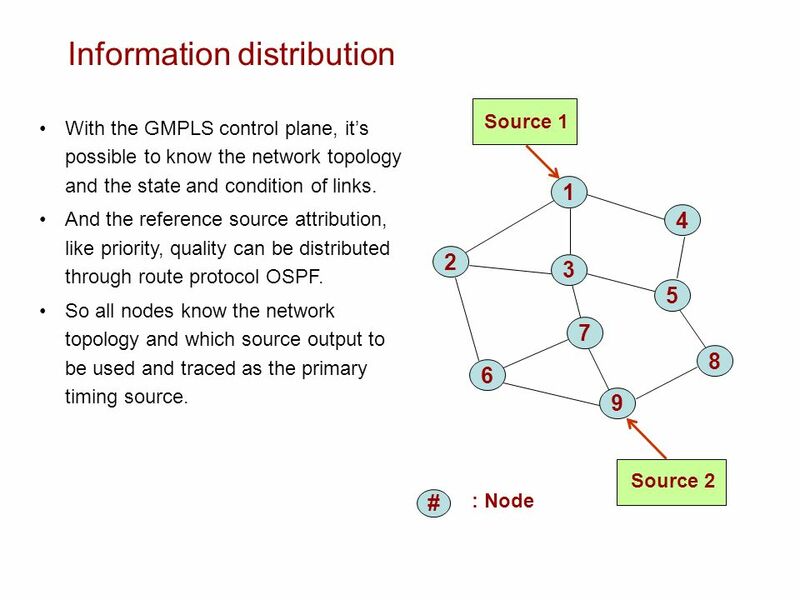 12 Information distribution # : Node Source 1 Source 2 1 4 2 3 7 5 6 8 9 With the GMPLS control plane, its possible to know the network topology and the state and condition of links. 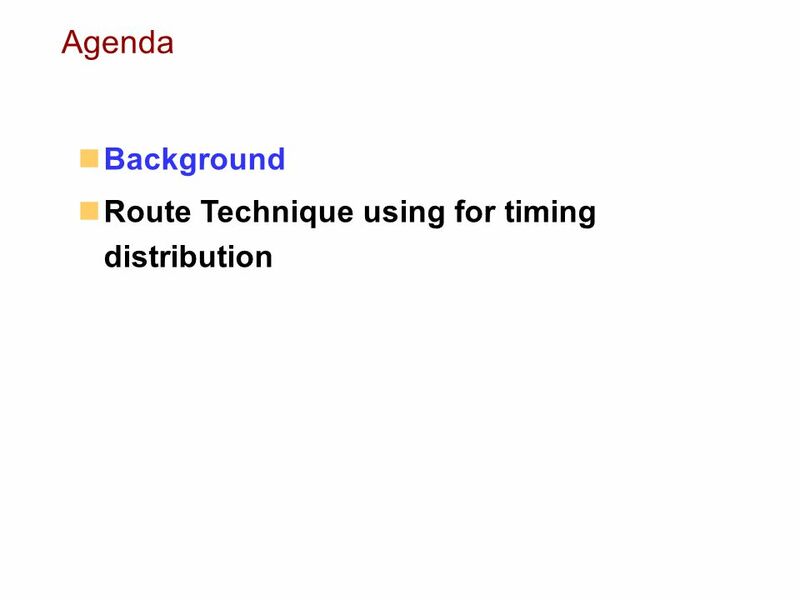 And the reference source attribution, like priority, quality can be distributed through route protocol OSPF. 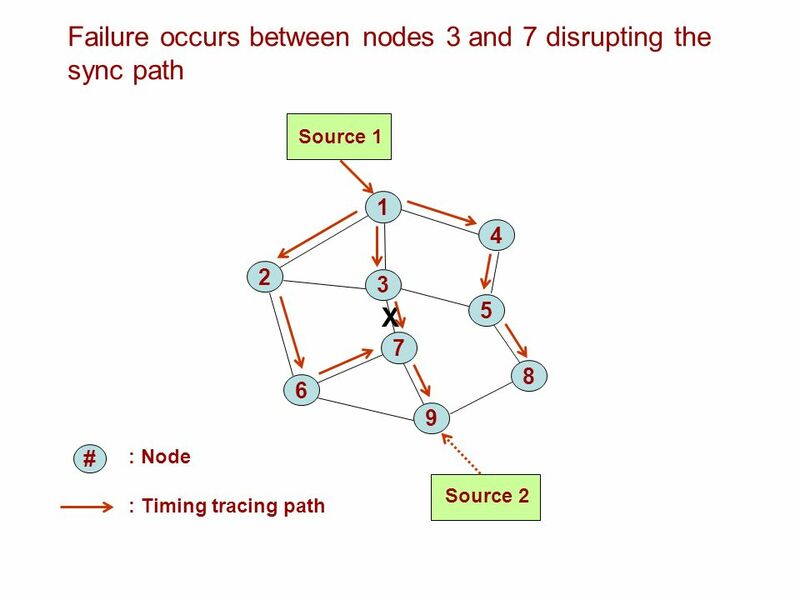 So all nodes know the network topology and which source output to be used and traced as the primary timing source. 13 Calculating the traceability paths : Node Source 1 Source 2 1 4 2 3 7 5 6 8 9 : Timing tracing path # Each node calculates the timing tracing path to the master clock source based on the topology and the primary source. From the root of the primary reference, simple calculating algorithm like Dijkstra can be used to establish a shortest path tree. 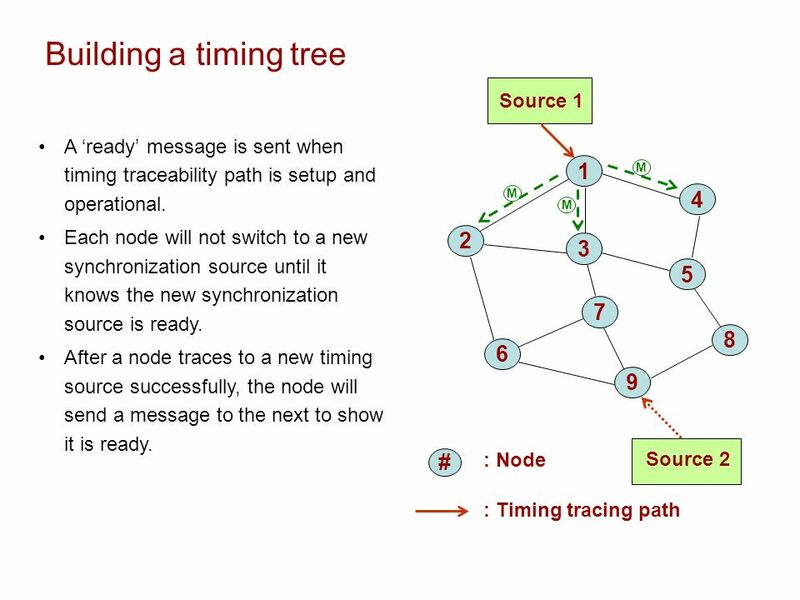 The synchronization distribution algorithm would be like a tree structure to prevent timing loop. 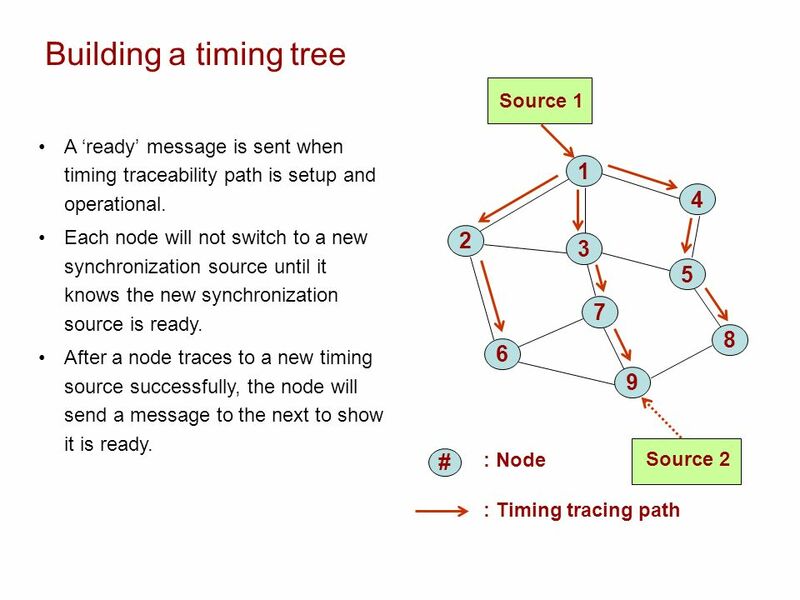 17 Building a timing tree : Node Source 1 Source 2 1 4 2 3 7 5 6 8 9 : Timing tracing path # A ready message is sent when timing traceability path is setup and operational. 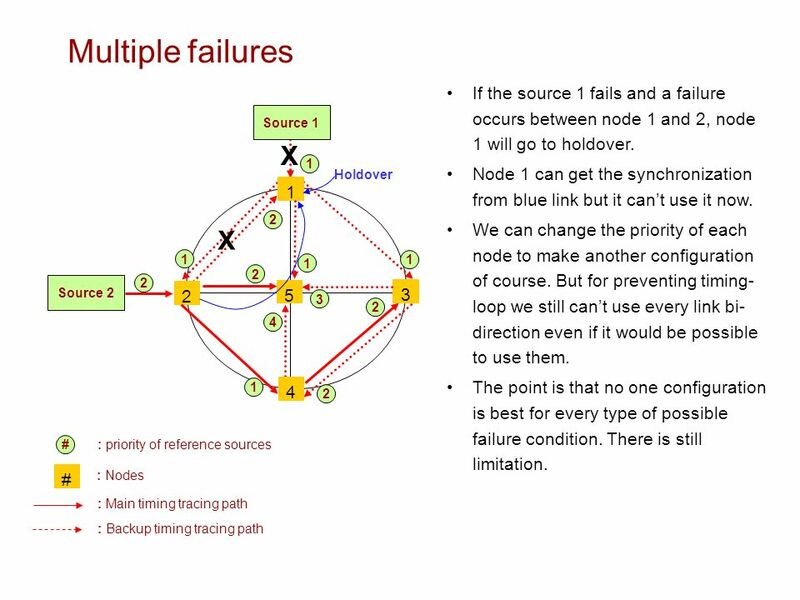 Each node will not switch to a new synchronization source until it knows the new synchronization source is ready. 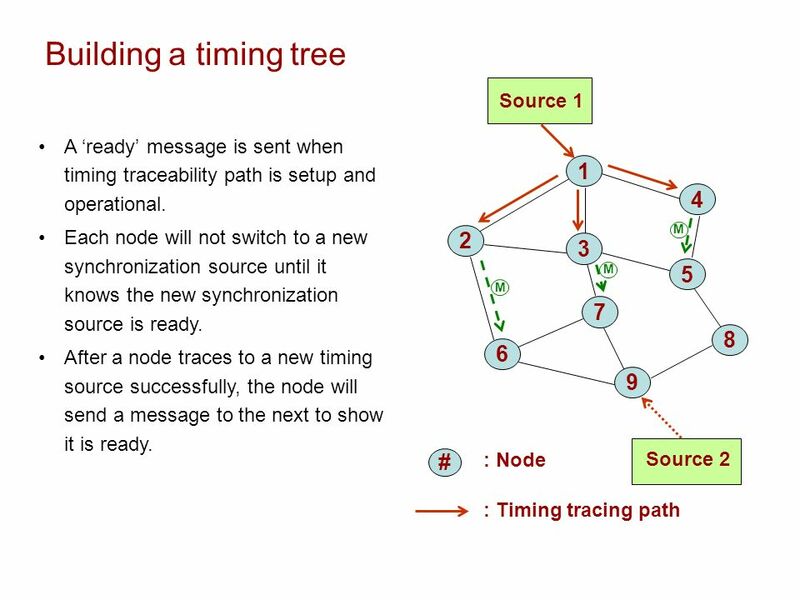 After a node traces to a new timing source successfully, the node will send a message to the next to show it is ready. 21 SSM=PRC Interworking with existing networks BITS 1 : Node which doesnt use automatic techniques : Main timing tracing path : Node which use automatic techniques : Backup timing tracing path Source1 SSM=PRC PRC SSM=SSU PRC SSM=PRC PRC DNU PRC BITS 4 BITS 2 BITS 3 1 1 2 1 2 2 1 1 1 1 2 2 2 PRC All blue nodes could be viewed as one node which use traditional SSM at the boundary to interwork with others. 23 Next Step Timing distribution is very important for synchronization. Comments from the group are always appreciated Working with CCAMP with respect to the GMPLS extensions, which supports this feature. 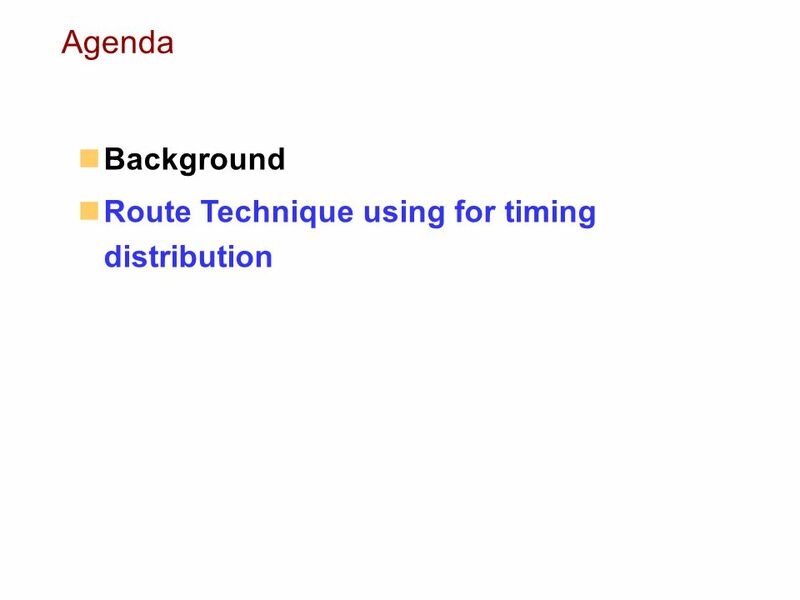 Download ppt "New Timing Distribution Mechanism TICTOC WG, IETF 71th Philadelphia, USA draft-ji-tictoc-new-timing-distribution-mechanism-00.txt Kuiwen Ji"
IEEE-1588 TM Profiles. [Page 1] Synchronization Categories Frequency synchronization (or syntonization) –Clocks are aligned in frequency Phase synchronization. 71st IETF Philadelphia, March 2008 ERO Extensions for Path Key draft-bradford-ccamp-path-key-ero-01.txt Richard Bradford : JP Vasseur. G : DCM Signaling Mechanism Using GMPLS RSVP-TE ITU-T Workshop on IP-Optical, Chitose, Japan 7/11/2002 Dimitrios Pendarakis, Tellium, Inc. ITU-T.
Generalized Multiprotocol Label Switching: An Overview of Signaling Enhancements and Recovery Techniques IEEE Communications Magazine July 2001. IP Fast Reroute Using Tunnel-AT draft-xu-ipfrr-tunnelat-00 Mingwei Xu, Lingtao Pan, Qing Li Tsinghua University, China 75 th IETF Meeting, Stockholm July. HIERARCHY REFERENCING TIME SYNCHRONIZATION PROTOCOL Prepared by : Sunny Kr. Lohani, Roll – 16 Sem – 7, Dept. of Comp. Sc. & Engg. Requirement and protocol for WSON and non-WSON interoperability CCAMP WG, IETF 81th, Quebec City, Canada draft-shimazaki-ccamp-wson-interoperability-00. TX- 1 Faculty ALTTC, Ghaziabad Survivability Of SDH Network By: TX-I Faculty ALTTC, Ghaziabad.